It’s no secret I am no great chef, and I love an easy recipe. 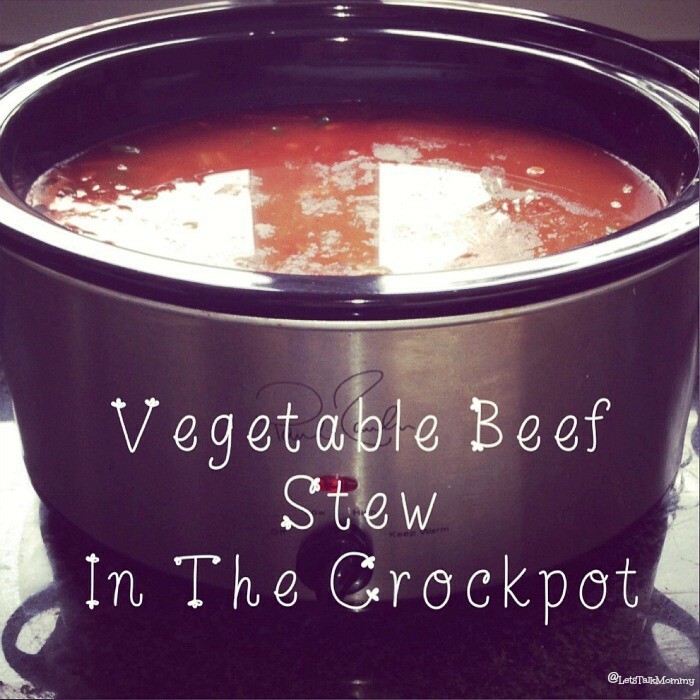 This is one of my favorites in the crock pot (slow cooker) because it’s fast, easy, and the whole family loves it. I can’t stand making separate meals for each kid and then another one for Mr P and I. Its great to find ones I can alter a little to accommodate the whole family. I leave the peelings on my potatoes, up to you then cube them. 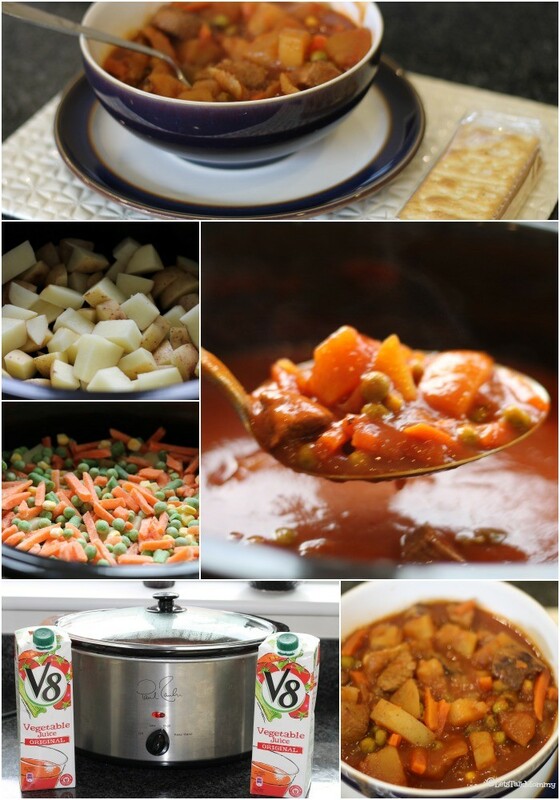 Layer your potatoes on the bottom of your crock pot (slow cooker). My crock pot (slow cooker) holds 5.5 liters. Then layer your vegetables on top of your potatoes. Cook your beef in a frying pan, on high for a few seconds to seal the meat, then layer on top of the vegetables. Slowly pour the V8 juice over top, until it’s covers all the ingredients completely and a little extra. My crock pot takes both liters of V8 to fill it. Yours may vary. In a small bowl I add about 1/4 cup of boiling water and smash the beef cubes in it, until dissolved. Then add it to your crock pot and stir gently in. Cook on HIGH for 5 hours, or LOW for 8 hours if you are going to work. Serve with crackers or hot dinner rolls! For Missy Moo (9 monts old), I pulse it in the blender for three pulses to break up the beef), for Buba, (2 years old) I cut the beef cubes and use a fork to smash the potatoes as he prefers it like this. Makes it yummy for the whole family to enjoy together. Please vote for Let’s Talk Mommy for Best Baby Blog & Best New Blog for the MAD Blog Finals! Award season is fully upon us now. I would love to be considered for Fresh Voice / Social Media for the BiBs! I am such a lazy cook, I think I use mine just about every other day. 😉 I could everything in it. So easy to use, and clean up afterwards. You should try it. You won’t regret it. Kindred spirits or just have the same great taste in food. That’s fantastic! I did Mel’s bread last week. It was yummy. Well I can definitely recommend it as an accompaniment for the stew! It is yummy isn’t it?! It’s so much healthier this way. 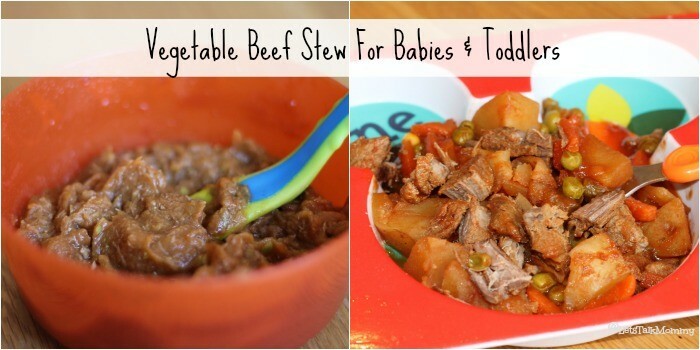 I actually got the idea out of an old diet book, it had cabbage and other stuff I didn’t like but I thought it worked well with potatoes and beef instead. I love it. It is so easy, fast, and yummy. My entire family love it so even on the summer months I like a good bowl of it. Glad you like. Thank you Vicki that means a lot from the recipe queen!!! 🙂 It’s one of our favorites.